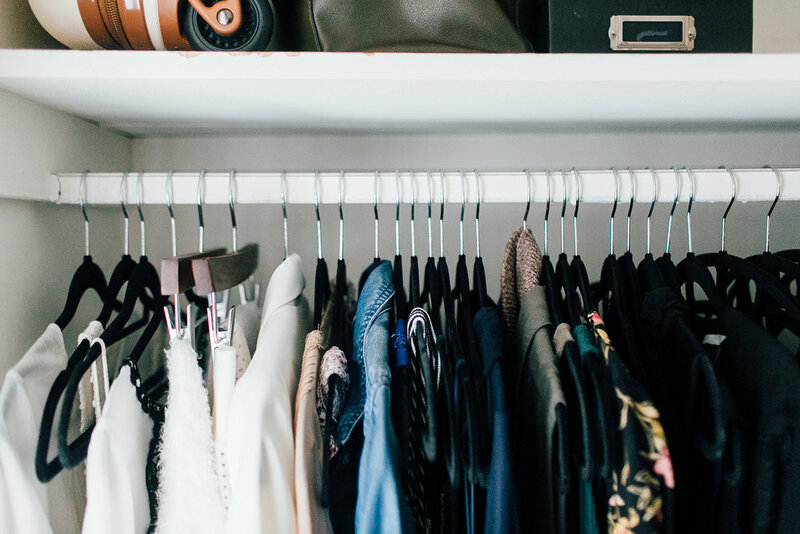 Having an organized closet is an incredibly freeing thing. Not only is it beautiful to the eye but it saves time and money. It takes the stress out of getting dressed because you know exactly what you have. Plus, all of the pieces that you do have are ones that you treasure - they are items that reflect your style, your life. When we are able to see what we have it avoids us purchasing items that we don't need. 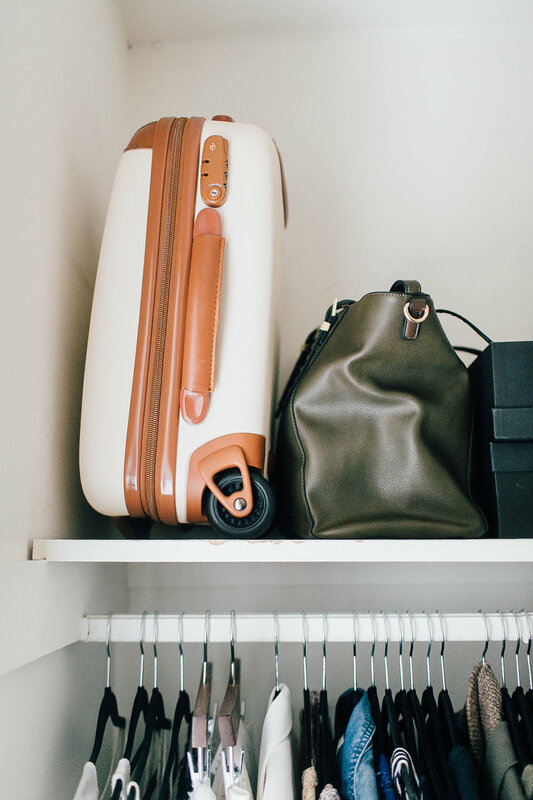 There are several ways in which you can organize your closet but one of the ways that I've found to be the most helpful is to organize by color. It doesn't matter where you start on the color wheel - just pick a color and start organizing your clothes accordingly. For example, I started organizing my clothes on the left side of my closet by the color ivory. All of my warm whites are at end, slowly blending into bright whites before moving onto the next color in line, purple. Connecting these two colors are a couple of pink, purple and white printed pieces. * Organizing by color allows you to see just how many items you really have. When I first started organizing my closet this way years ago, I had no idea how many black shirts and sweaters that I had! It made me think twice before buying any more. After you've grouped your clothing by color, go back and begin organizing by type of clothing. For example, back to the left side of my closet - I began organizing my ivory colored clothing by dresses, then shirts. Shortest to longest. Again this allows you to see how many of a type of item you really have. Due to the extra bulk of jeans/pants, I place them at the end of all of these groupings (see photos above). I fold my pants but clipping them with those clip hangers works too. Streamline your closet by purchasing the same style and color hanger for all of your clothes. This helps to take away extra noise, instead keeping your focus on your clothes. I find the black velvet hangers work quite well as they keep clothing in place, are thin, and fade into the background. Wooden hangers are great too however clothing can sometimes slip off of these. Another way in which you can streamline your closet is by purchasing the same style shoe box if that is how you store your shoes. Create little tabs or snap a Polaroid of the shoe to easily identify. 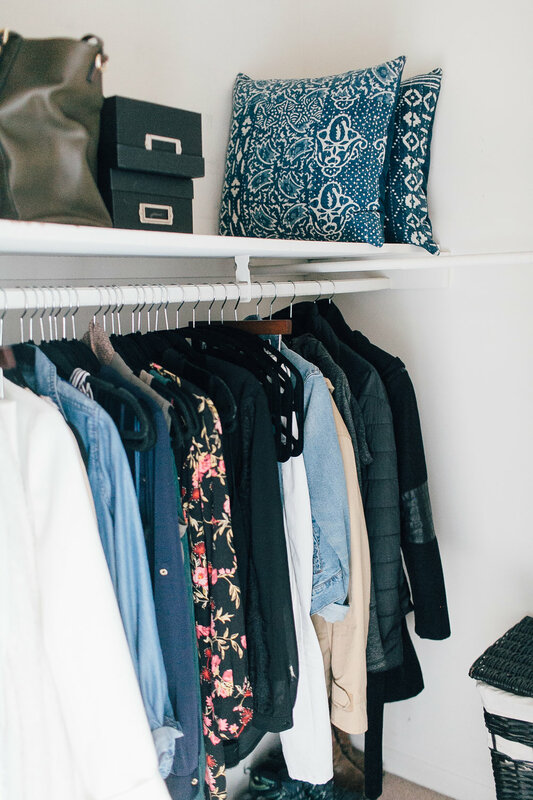 Setting boundaries for your closet is a good way to ensure maintenance of the space. One boundary that I've set is that for every piece that comes into my closet, 1-3 pieces must leave. Another guideline that I've set is that I have a certain amount of black velvet hangers. All but 3 are currently being used. If I were to use up the remaining 3 hangers, I’ve made a rule that I wouldn't be allowed to bring any more items into the closet because I would have reached my limit - there would be no hangers left! Sure I could squeeze some more in if I bought them but that starts to decrease the beauty and function of my closet. My clothes would be squished together and would make it harder to see what I have. Some clothes may even become damaged or “lost” in the chaos. You can make a space as beautiful as you want but if you can't use it or work in it then it's not doing its job. This is especially true for closets. We can color code, organize by style, and streamline things but it has to work for you. Hang as much of your clothes as possible. When you see something you are a lot more likely to wear it. *Group your solids together separate but next to your similar colored prints. ** I currently house my jackets and coats in our walk-in closet due to the size and lack of coat-closet.